I graduated from Rensselaer Polytechnic Institute with Bachelor and Master Degrees in Mechanical Engineering, and then went to work for a consulting firm in Schenectady, NY that specialized in steam turbine performance. Soon after I became a licensed Professional Engineer and worked my way up to Technical Director of Power Plant Performance. There were many turbine tests, steam path audits, heat balance analyses, seminars, and much software development along the way. 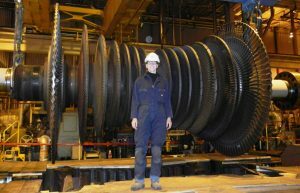 I started with MD&A in 1999 and currently have 31 years in the steam turbine performance business. My job at MD&A is twofold. I help turbine owners improve and maintain the thermal performance of their steam turbines. And, I help divisions within MD&A to improve steam turbine performance on customer equipment. See our Seminars page for Deborah Cioffi’s Evaluating & Improving Steam Turbine Performance Seminar. What is the most interesting performance challenge you have come across at a jobsite? The performance challenge that was the most rewarding to me started with an urgent call from one of our crew supervisors who was on site during a startup right before Christmas. The turbine overhaul and startup went well, but the post-overhaul power output was significantly below expectations. The owner was insisting that our crew stay through Christmas to take the machine apart again to fix the problem. I looked at some performance data and concluded the turbine was in fine shape, but the power measurement looked odd. Sure enough, they had a problem with the power instrumentation. After fixing the instrumentation problem, the measured power output was spot on and the crew was able to get home to their families for the holidays. The thank-you note that I received from the supervisor on behalf of the crew is prominently displayed in my office to remind me this turbine business is really a people business. How does surface roughness affect steam turbine efficiency? Surface roughness is the single largest consistent contributor to steam turbine efficiency degradation. Most of the losses occur as a result of poor water chemistry control. The roughened surfaces cause turbulence at the boundary layer level that robs the stage of thermal energy that would otherwise produce power. It’s not an easy problem to solve, but the potential rewards are great. Despite that, I’ve seen power producers cut back their water chemistry resources. I would like to see more work done in this area to help plants keep impurities out of the steam. What are the principal characteristics of the individual steam turbine stages in regards to steam turbine stage efficiency? The three most important efficiency considerations in steam turbine stages are: 1) the surface finish, 2) the aerodynamic profile, and 3) the seal leakage. The surfaces want to be smooth and free of deposits, dings and machining marks. The profiles want to follow smooth streamlines, with uniform geometry across rows of blading, and without thick trailing edges that may cause waking. The seals want to minimize leakage around the stationary and rotating blading during normal operation and during load shifts and vibration events. I like to spend time in the Adirondacks hiking, skiing, mountain & road biking and boating with my husband and two sons. Eventually I’d like to become a “46er,” hiking all 46 high peaks of the Adirondacks. It’s going to take a while though…I’ve got 4 down and 42 to go! Contact Deborah today using our Contact form.